Studying England ahead of Monday's European Championship qualifier was a hard watch for Montenegro coach Ljubisa Tumbakovic, who says the Three Lions have no weaknesses. England have been rejuvenated under Gareth Southgate, who led them to a World Cup semi-final appearance before securing a place at the Nations League Finals at the expense of Croatia in November. 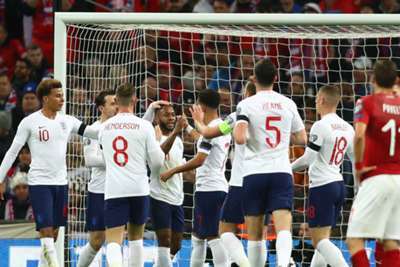 A 5-0 thrashing of the Czech Republic on Friday kicked off England's Euro 2020 qualifying campaign with a bang, Raheem Sterling scoring at hat-trick at Wembley. However, Montenegro have a commendable record against England since becoming an independent footballing nation in 2007, drawing three and losing one of their four encounters. While some may use that to suggest England could come unstuck in Podgorica, Tumbakovic knows the visiting side will be tough to break down. "The model and the way England plays is something special," he said. "I'm really trying [to find a weakness] but I can't. We in the coaching team who deal with the players are realistic. "Things that happen in the past are just nice results for Montenegro, tomorrow we will play a match with totally different players, new coaches, with different capabilities and different ideas from both teams. "The absolute favourite in this game is England but if we enter this game like losers, then why are we even playing? I will prepare the team in a different way. Would that be brave or crazy? I don't know, but it's in the spirit of sports." Montenegro started Group A with a 1-1 draw as a late Todor Nedelev penalty earned Bulgaria a point in Sofia. Tumbakovic was not happy with aspects of his side's performance in that game, but expects things to improve on Monday. "The importance of the start of the qualifiers, the first game, brings its own importance, its own responsibilities," he added. "Because of that there were nerves in the players from both national teams [on Friday], that is why there was a lack of quality that would have made that game even more beautiful than it was. "Our performance in the second half was a lot better but still far away from the quality of football Montenegro can show in this competition. "That is why I do believe this second game will be at a higher level than the first one."